Established in 2007, the committee meet regularly to make plans. With the help of FFW members and community partners, they action changes to the natural environment of the Walk as well as community events to encourage constructive use of the historic bandstand and space. In 2010, we are pleased to announce we have won our first Green Flag award, given to recognise and reward the best green spaces in the country. The Green Flag assessor commented "The transformation of this once neglected site is due to the work of the local enthusiasm of the friends group and the support of the Council. They have achieved a welcoming small linear park for the local residents and shoppers from the nearby retail areas, and an attractive route linking the shopping areas to the seafront road and beaches." A series of monthly events in the Walk, ending with a grand celebration of live music and performance on the Bandstand in August 2008, celebrated the regeneration of the Walk and the communal nature of the space. Over 300 local people attended each of our annual Spooky Storytelling event in October 2008 and 2009. All our events are free and we fund work using membership income, donations and grants. 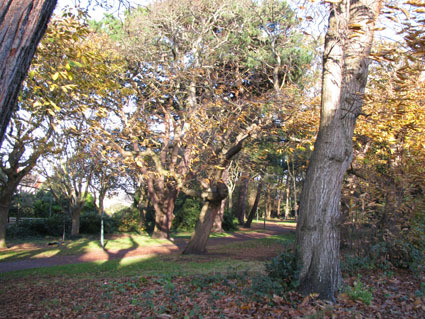 We work with local groups and partner Bournemouth Parks Department and Libraries as well as local traders and churches.